Guess what!! YES! 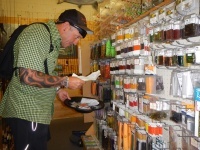 Stu's Fly Shop - online - is OPEN for the new coming season for the next 9 months. So now you can shop till you drop from your home I will send your order to you - where ever you are in the world! I hope you are all well and happy! Hopefully you will all like the new updated blog that you can all read every week and hopefully smile and enjoy whilst you are reading it. Check out the links to my friends on the blog as well and USA photos.